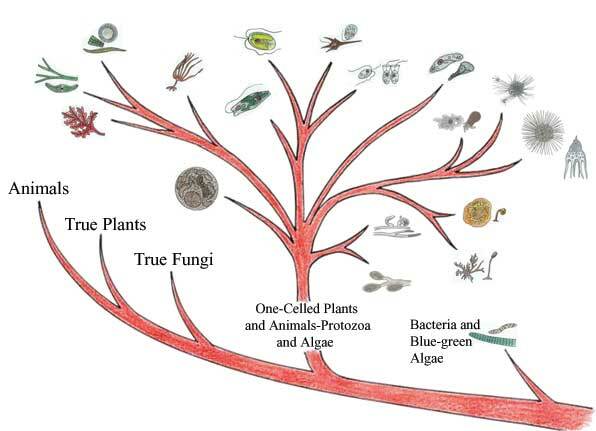 This "tree" provides examples of Golden Alga (Prymnesium parvum) and other phyla in the Kingdom Protista of one-celled plants and animals. Click on the images to learn more about each organism or for a complete list with descriptions go to Kingdom Protista. Organization above is diagrammatic and may not reflect evolutionary associations, which are frequently updated and revised. Educational and non-commercial use is permitted. If you have difficulty accessing this document, contact us for an alternative format.